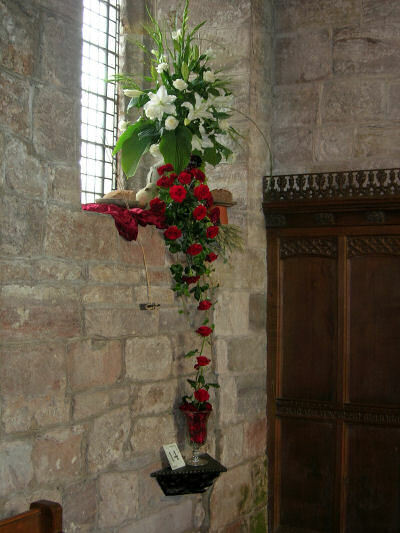 After Friday’s deluge the fine weekend brought visitors flocking to St Lawrence Church Morland for the Flower Festival, ‘Portrait of our Parish’. 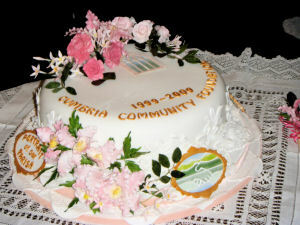 At the opening ceremony on Friday evening a special cake was cut by Catherine Alexander , a trustee of the Cumbria Community Foundation, and Jean Scott, chair of the Festival committee. The cake was made and beautifully decorated by Rosemary Irvin to celebrate the Foundation’s 10th Anniversary Fund which had made a grant to Morland towards the event. Saturday saw a steady stream of visitors viewing the magnificent displays which the arrangers had worked on for three days under the expert eye of organiser Patti Dawson. 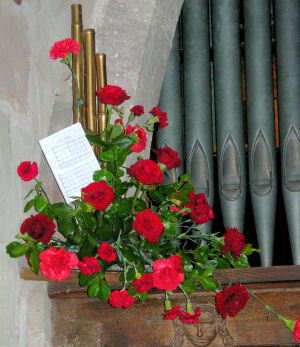 This was followed in the evening by a concert ‘Music for a Summer Evening’ organised by David Jones which featured local musicians who also provided music over the weekend in church. On Sunday morning at the well attended Family Communion Service the congregation welcomed two babies who were baptised, Jasmine Anne Harrison and Ptolemy John Evans .The church was then open again to visitors. 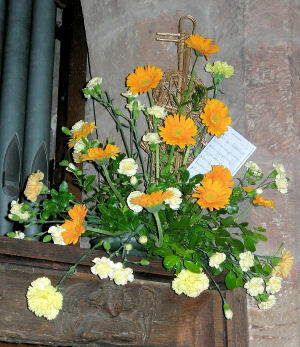 There were twenty-one special floral arrangements each of which represented a different aspect of life or activity in the parish. 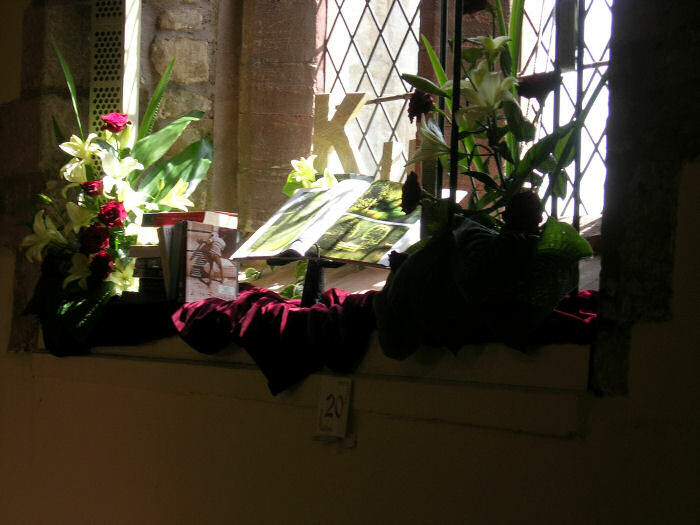 Every window and spare area was filled with wonderful flowers which gave an imaginative interpretation of a different aspect of community life in this rural parish of Morland, Newby, Sleagill and King’s Meaburn. Many visitors commented on how many things were going on in the villages. Lunches and cream teas were served to visitors in the Village Hall by a team led by Cathleen Lisle and Judith Lightburn. While refreshments were being served there was an opportunity to watch a visual presentation of village scenes and events mounted by local photographer Mike Billing. 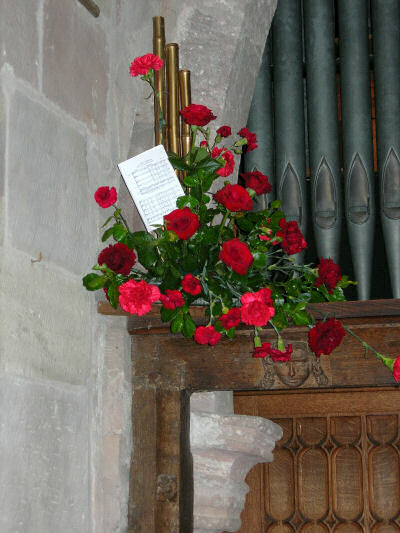 There was also a Treasure Hunt around Morland which was won by Dot Bell and family; a competition to guess the birthday of Tufty , the topiary squirrel in the churchyard which was won by Kath Makinson who chose the date 8th June, and a quiz which has still to be judged. 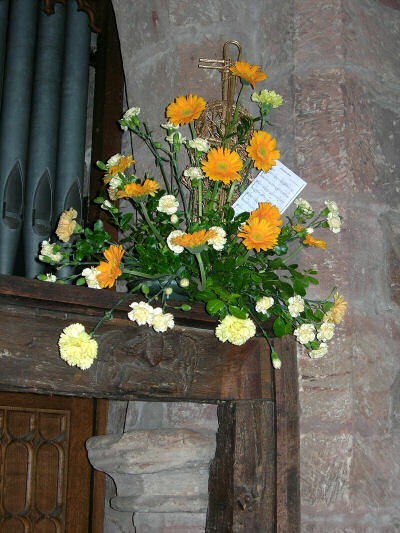 The organisers report that it was a most successful event which worked to bring together so many members of the community who were involved in arranging flowers, catering or stewarding, a generous number of local sponsors and of course those who came to view the festival. It has also raised a substantial sum to help to maintain the fabric of the beautiful church of St Lawrence which has been at the centre of village life for over a thousand years. Click here to see Mike Billing’s pictures of the event. 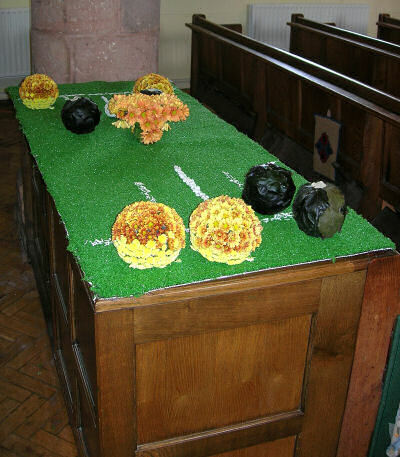 Scroll down to see some photographs of the displays.